As a parent, you spend most of your time ensuring your children’s safety. You buy them helmets for bike rides, cell phones to keep track of them, and nutritious food to help them grow and stay healthy. But there’s another danger that you may not have considered before: plastics. We use plastic to package food in our daily lives, but is that truly a safe way to carry lunches to and from work and school? For many experts, the answer is a resounding no. Melamine can be particularly harmful plastic, and it’s important to fully understand what dangers it presents and why melamine-free bento lunch boxes might be the perfect solution when it comes to protecting your children from harmful plastic chemicals. You’ve likely heard of BPA and PVC, but melamine may be unfamiliar to you, though it’s been used across the world for decades. Melamine is a white, crystalline chemical that is often combined with formaldehyde to create plastic. The resulting products are smooth, hard objects that are reminiscent of ceramic but much sturdier, lighter, and able to withstand breakage. Melamine is relatively affordable and has a shiny quality that often helps it look like real china, making it seem like a worthy investment. As a result, melamine is a popular choice for restaurant and home dining because it can be trusted to stay in one piece in all sorts of dining room situations. It is often used to make plates, cups, bowls, saucers, trays, ramekins, and even utensils like forks and chopsticks, particularly for small children. Melamine is often brightly-colored, making it particularly eye-catching for kids. However, recent research shows that children are particularly susceptible to falling ill after eating from melamine dishware. Due to the ubiquity of melamine dishware, it is important to keep an eye out for it and read labels carefully, as many consumer goods stores now carry these products. Melamine was invented in the 1830s by a German scientist and became popular in the 1930s. Because it is able to withstand high temperatures without cracking or melting, it was often used on U.S. Navy ships during World War II. After the war, several companies created molded dinnerware for consumer use. These items were known as “Melmac” dinnerware, and they became a standard feature of many American homes. During the 1950s, Melmac became particularly popular, due largely to a desire for more modern aesthetics and an interest in futuristic technology. Though melamine was, at this point, old science, its versatility, durability, and shine appealed to these modern-leaning desires. The colorful plates and bowls remained in style until the 1970s, when families abandoned the scratch- and stain-prone Melmac items in favor of sturdier plastics, china, ceramic, and glass, which would retain their pristine appearance for a longer period of time. Now, Melmac has once again become popular among collectors, who scour sites like eBay to find vintage melamine plates. Various companies are also designing and releasing new melamine dinnerware as part of retro-themed collections, which are fueled by today’s new appreciation for vintage styles. In 2007, wheat gluten and rice protein containing melamine — which appears as a protein in some food tests and was sometimes used as a filler — was shipped from China to pet food companies around the world, causing thousands of pet deaths. Companies around the world were forced to recall their products until they could determine the cause of the widespread fatalities. Melamine was also discovered in Chinese-manufactured baby formula in 2008, causing at least two infant deaths and sickening more than 1,000 babies as a result. 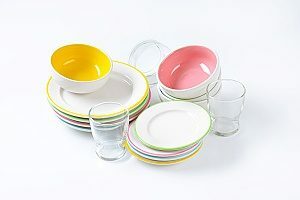 Since then, families have been more concerned about melamine and cautious about the content of their plastic dinnerware. Melamine is dangerous if ingested, but what about eating food that has been placed on a melamine dish? Thanks to the chemicals used to construct melamine, adding heat or acid, like orange juice, to a melamine-based plate or cup can be harmful. Heat and acid can both trigger a reaction that causes melamine to become unstable, allowing the melamine particles within the plastic to seep into your food, according to a 2013 study. In high concentrations sustained from repeated use of melamine dishware that has been exposed to these conditions, melamine can cause kidney stones and kidney failure. In certain instances, as in the 2008 baby formula case, it has resulted in the deaths of small children. The FDA, however, considers melamine generally safe for use, so long as it is not heated to temperatures above 160 degrees. Melamine is therefore not considered safe to use in ovens or microwaves. If you do have melamine dishware at home, it is imperative to avoid heating it in the microwave or using it for acidic foods and drinks until you are able to replace them with safer alternatives. Melamine that has been accidentally heated even once could cause the plastic to become unstable and continue leaching dangerous chemicals into food, increasing the risk for kidney problems. Thanks to increasing awareness of the dangers behind melamine and other plastics, there is a wealth of alternative dinnerware and storage containers available today. 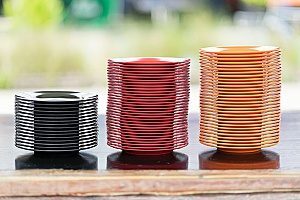 Many companies now embrace metal, wood, and heat-safe plastic as materials for their dinnerware and food storage products. Bento lunch boxes can be one way to ensure that your meals-on-the-go are being packed in a safe container. Metal bento lunch boxes are free of melamine, BPA, PVC, lead, and phthalate, making them a safer choice for your family. The boxes are divided into multiple compartments, which helps pack multiple foods in one container and can also provide easy portion control guidelines. Their snap-on lids make storage and morning packing simple, as one lid for one box can be easier to locate than several lids for multiple differently-sized containers. When it comes time to replace your melamine dishware, consider purchasing bento lunch boxes for your family as a convenient, safe alternative.